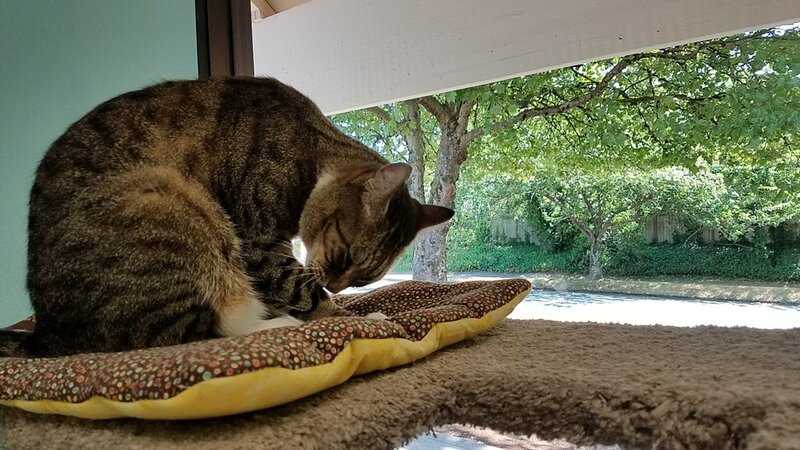 Daily cage-free care includes pre-meal playtime with our interactive toys, two healthy meals with an additional midday snack upon request, treats, cat trees with a great view, and lots of toys and attention! Kitties are put into their condos at night for safety and security. 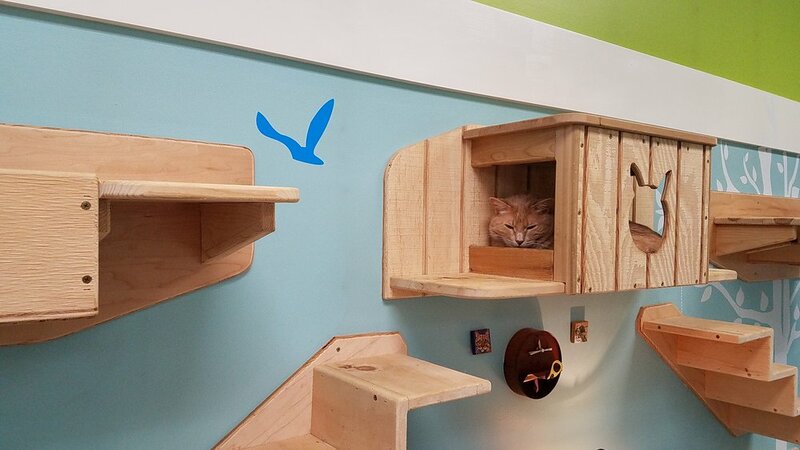 Each condo is complete with food, water, litter box, and a cozy hideaway bed just for your kitty. Our staff is very observant and we like to keep parents up to date with how their fur-babies are doing and do our best to make them feel welcome and at home in our beautiful boarding facilities. 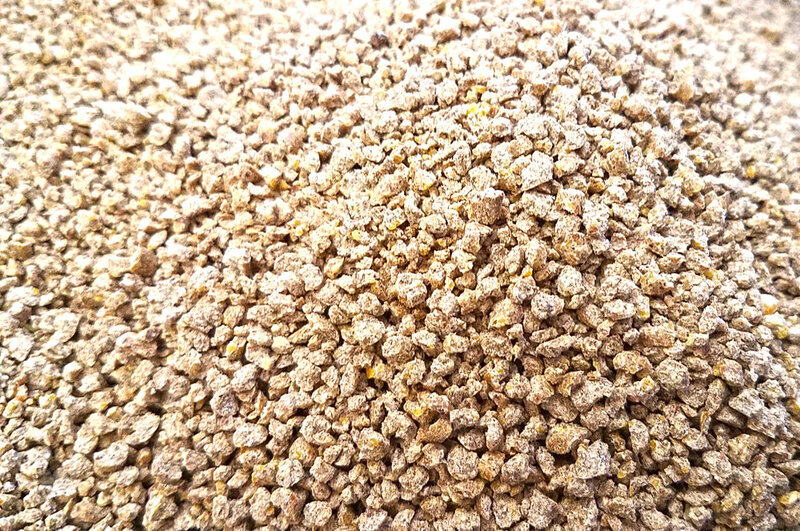 We use an all natural, corn based litter that has outstanding odor control, clumps quickly and is easy to scoop. It's flush-able and septic safe, lightweight, 99% dust free, and pet friendly. There are no synthetic additives, chemicals, clay, or perfumes, and are made from sustainable, grown ingredients. Every condo comes with a cozy cube bed, litter box (multiple sizes available), water, and food. We also have flat beds available for cats that prefer flatter beds. Collars are removed for safety and comfort. If your cat is boarding with us, please remove their collars prior to drop off. Boarding is subject to availability. Currently, The Whole Cat and Kaboodle CANNOT accommodate diabetic cats for in-store boarding. Oral medication (by mouth or in food) is complementary. For all other medical accommodation inquiries, please call any of our locations. Reservations are required and can be made by calling (425) 576-5548 for Kirkland or (425) 307-1008 for Redmond. Please fill out a boarding release waiver online prior to drop off. Please fill out the form fully and to the best of your ability, and be clear when describing your cat, including any issues they have had in the past, any surgeries or diagnosis from the vet, and any concerns you have while they stay with us. Rabies and FRCP are required for cats over 4 months of age. We need this for the health department, safety of our other kitty customers, and anyone who comes to visit our stores and play with the kitties. We will ask for a vaccination record as well as a rabies certification to be sent to our email address. If my cat named above becomes ill / injured, I request that The Whole Cat & Kaboodle takes her/him to: (vet name, business name, phone number, address, email if applicable). We need ALL this information BEFORE we can board your kitty. Dr. Richard Lester, OR any veterinarian of their choice in the event that ours is not available. I understand that I will assume full responsibility upon my return for payment and / or reimbursement for veterinary services rendered up to the below stated amount. I understand that The Whole Cat & Kaboodle cannot be held responsible for the results of the veterinary treatment or the loss of my pet. We require that all cats in our boarding facility be current on FRCP vaccine per their veterinarian's recommendations (this requirement does not apply to those cats 10 years or older. Any cat who is FIV or FELV positive will not be allowed out of their cages during their stay. All persons entering the boarding room are either staff people, volunteers, or store customers who have signed a legal waiver. I understand that The Whole Cat & Kaboodle will allow my cat to socialize with other boarding cats, store customers, employees and volunteers who work at the store. I have advised The Whole Cat & Kaboodle of any behavioral issues that my cat has exhibited in the past when socializing with other cats and / or people. I acknowledge that when outside of their cage and potentially socializing with other boarding cats, my cat may be exposed to injury via bites, scratches, a fall, etc. I agree that I am financially responsible for any veterinary treatment treatment that may be required if my cat should be injured or become ill. I will remain legally responsible for any injuries that my cat inflicts or causes when socializing with persons at the store and indemnify The Whole Cat & Kaboodle from any claims, causes of actions and requests for payment of any kind, including any requests to pay medical bills related to any such injuries. I will advise The Whole Cat & Kaboodle immediately should I become aware that my cat as any behavioral problems or dangerous tendencies. If you do not wish for your cat to socialize with other boarding cats or persons that visit the store they will need to stay in their cage for the duration of their stay with us. Payment will be required for pick up. YES I give my permission for my cat to be free to leave her/his cage and socialize with persons (as outlined above) and other boarding cats. NO I do NOT give my permission for my cat to leave her/his cage or interact with others. During your cat's stay, it may become advantageous for them to receive an appetite stimulant, an antiemetic, subcutaneous fluids, or probiotics. To grant permission to do so, initial below with today's date. Is your cat fractious? Sensitive in certain spots on their body? Specific dietary needs, if you are bringing your own food, if it is okay to use our wet food or raw food, preferred flavors (tuna, chicken, beef, etc), if you would like to transition your kitty into a wet or raw diet, if you would like help with transitioning while your kitty is staying with us, what products you use from our store that your kitty likes, any physical or psychological problems your cat experiences, etc. Staff notes can be placed here as well! I give my consent for my cat's image and likeness to be used by The Whole Cat and Kaboodle for educational & promotional purposes. Including but not limited to print, video based marketing, social media, and any other store publication. This agreement is made valid starting on the date below whenever The Whole Cat & Kaboodle cares for my pets. I understand that by writing my name and today's date that this is a binding contract and that I understand the rules and regulations while having my cat board at The Whole Cat & Kaboodle. I understand that I am responsible for paying the full amount due prior to pick up of my cat. Filling out the boarding release waiver online does NOT guarantee a condo spot in our boarding facilities. All boarding requests MUST be reserved and scheduled by calling or visiting our stores, and coordinating with our staff and store's availability. Our store numbers are (425)576-5548 for Kirkland, and (425)307-1008 for Redmond. Thank you! Please note the following: filling out the boarding release waiver online does NOT guarantee a condo spot in our boarding facilities. All boarding requests MUST be reserved and scheduled by calling or visiting our stores, and coordinating with our staff and store's availability. Our store numbers are (425)576-5548 for Kirkland, and (425)307-1008 for Redmond.